Anyway! To the outfit! 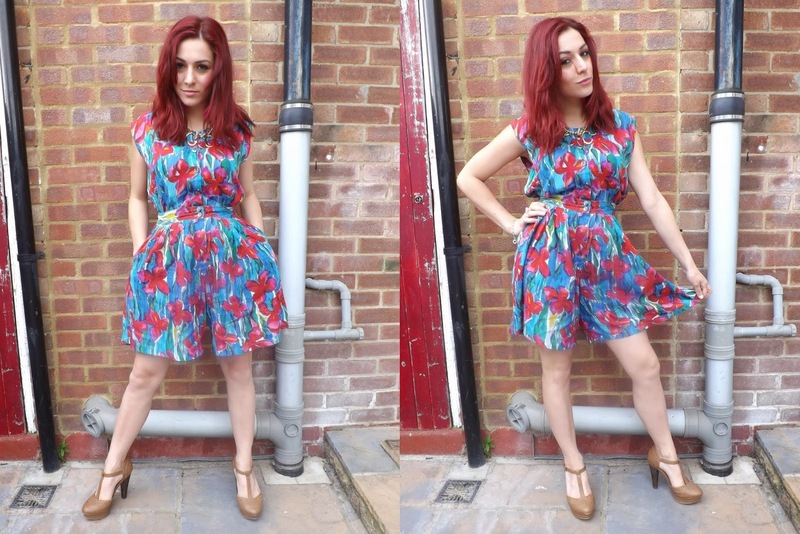 Can you believe this pretty vivid floral playsuit is from a carboot sale? Sometimes you get those people selling brand new unbranded clothes, and I was very attracted to the bright print on this playsuit. I didn't know it was a playsuit either until I went to put it on! But I was happily surprised by this! She sold me this, with another playsuit in the same style but a different print for just £5. BARGAIN. For a playsuit like this, I could only pair it with my trusty Miss Selfridge heels I bought in the summer sale 2 years ago, and I also sported my current favourite necklace from Topshop. I really loved this outfit, and felt so pretty today. The long legs meant I was super comfortable in it too and I also got some lovely compliments from the ladies at the 'Hook A Bag' stall at the fair... They said I should be a model! "Oh stop it... *blush*" As for nails, I recently bought some cheap nail art brushes from eBay and now I can create cute nail art! This is my first design with the brushes and I can't wait to try out more... eBay is definitely the way for nail art products! Not bad for my first design!? What should I do on my nails next?